Would you want to wear banana shoes? 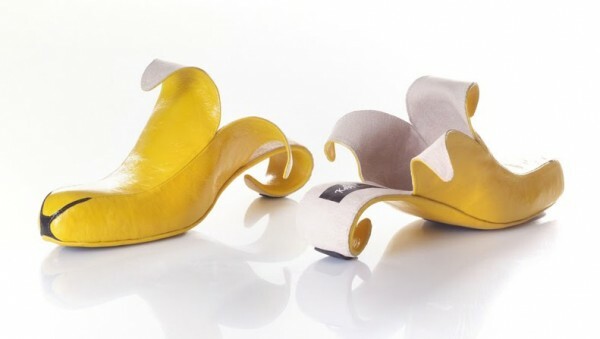 The banana shoes are the creation of Israeli designer Kobi Levi. I’d like to tell you all that the years I lived in the Middle East somehow give me an extra insight into Israeli banana shoes, but I can’t say that they really do. When I was little and first saw a cartoon of a man slipping on a banana peel, I didn’t get it. I asked my mother to explain it and didn’t totally accept her explanation. Her explanation was that banana peels can be slippery and some people think other people’s misfortunes are humorous. I believed the latter part about a lot of people being dicks, but I felt I had to gather empirical evidence about the whole slipping on banana peels thing. I tried to slip on a banana peel repeatedly, but it is apparently one of those things which simply can’t be achieved by someone who is trying to do it. My mother was impressed by my application of the scientific method to banana peel slippage. I think she still believes I should be a scientist when I grow up. A proper scientist, not one of those soft social science scientists. Kobi Levi also . . .